It's spring and I have a tiny little blue convertible. That could actually be my post for the day. Most of you have probably already envisioned yourself scooting off into the sunset based on that one sentence alone. But there's more to the story. I bought my Honda del Sol 21 years ago when I was 30. In debating the purchase of my two-seater, I remember thinking, "this may be my last chance to own a horribly impractical car." So I bought it. And I don't think any single purchase in my life has brought me as much joy as that horribly impractical two-seater. Over the years I've shared a lot of memories with this car. I like to use it to pick up Christmas trees, in part to see the look on the tree guys' faces, but also because it's good at hauling trees. It's been "totaled" a couple of times. A fender bender is enough to total it these days. The last time the guy was going to put a junk title on it, but I cried and told him it wasn't junk. So it still has a clear title. :D I no longer drive it on the highway anymore, though. SUVs are so big that it's hard to see my car. I mean, the car comes to maybe the middle of my torso. It's very low to the ground. Which makes 60mph feel like 80mph. Which is kind of fun. It has only failed to start on the first try twice in its lifetime. Both were because of dead batteries. See, I only drive it once a month or so. I had to get another car 10 years ago because the del Sol was no longer big enough for my family. Prior to that my big dog, Passion would sit in the passenger seat and people would laugh and stare because she looked so human with her straight back and forward gaze. Like one man got out of his car at a stoplight to say, "I couldn't tell if she was a dog or a really ugly human." Back then, she went everywhere with me. 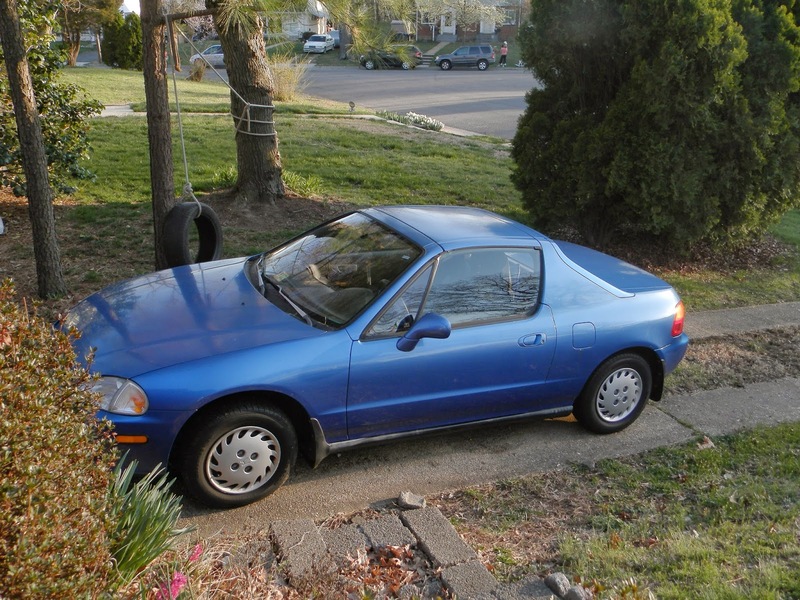 My little del Sol is small, a hazard to drive, crunches easily, none of my dogs will ride in it, it can't drive in snow, it's a little rusty and, frankly, it frequently shakes at higher speeds. It's completely impractical. I'm sorry to say, I probably wouldn't buy it today. But I'm so glad I have it. It reminds me that not all decisions have to be made with the head or with the future in mind. And that a "smart" purchase isn't always measured in things like safety ratings or hauling capacity. It can sometimes be measured by how many beats your heart skips when you get behind the wheel and how broad your smile is when you think of it. She only has 94K on her. She runs like a top and always has. I might have her another 20 years. She's one of the smartest decisions I've ever made. I really debated it at the time. I remember I had a creative partner that told me I was far to prissy to let the wind blow through my hair (it was the 90s and I had helmet hair). But that was exactly why I was buying it. I will say, though...convertibles are HOT. The sun shines right on you and if you're not moving, it's very hot. Being a pale person, this was an issue. But the nice thing about the delSol is that you can lower the back window. So you can leave the top on, lower all the windows and get the full convertible wind without all the convertible sun. This turned out to be a blessing for me, because for a while I was a little regretful I didn't get a Miata, but it turns out I made the right choice. Besides you NEVER see Miatas on the road anymore, but you still see del Sols. Ha, I never thought about the heat issue. And while I don't think I'm as pale as you, I still have to mind the sun. And my hair tangles really easily. So, maybe it really was the right choice :D Glad you don't regret your choice, though, and nice to have some convertible joy, even if vicariously!